Season the wings with salt and pepper. Process the oil, tomato paste, oregano, brown sugar, shallot, garlic, and hot pepper sauce in a blender until smooth. Combine the wings and sauce in a large self-sealing plastic bag, and coat the wings with the sauce. Let stand at room temperature for no more than 90 minutes. Preheat the oven to 375F (190C). Spread the chicken on an oiled baking sheet. Bake for 30 minutes (if Frozen place in oven before preheating and add an extra 30 minutes). Turn the wings and bake for 15 minutes more, until the wings show no sign of pink when pierced at the bone. Meanwhile, mix the dip ingredients in a bowl. 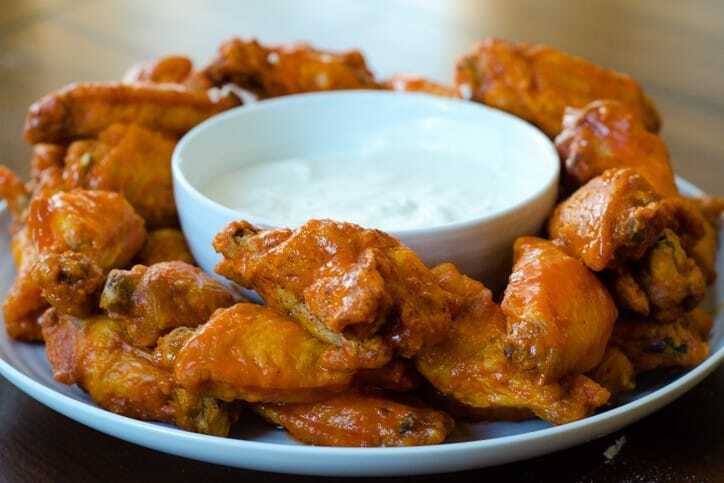 Serve the chicken wings hot, with the dip on the side, and a bowl to collect the bones.